One of the most striking differences between these two pictures is the total disappearance of chimney stacks from the skyline. 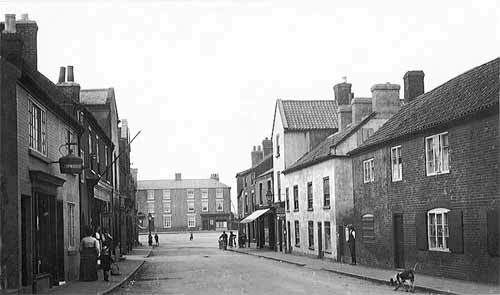 The first three buildings on the right in the c.1910 picture date from the 1700s. These where possibly farm workers’ cottages with a fairly large yards at the rear. The conversion to accommodate the present hairdressers, at No. 11a, retains the original window openings. The frames on the first floor, have central opening casements, now hinged at the top, although originally they were possibly Yorkshire sashes. The ground floor shutters have gone but the arched brick lintels remain. The height and width of the doorway has been increased. Like so many other buildings in the town, all exterior brickwork has been rendered and painted white with the inevitable loss of character. Between No. 11a and the next pair of cottages is a double-gated cart entrance to the yard at the rear, the cottages being associated with the three-storey farmhouse, built in the late 1700s. The 1910 picture shows both buildings were rendered and lime-washed. Directories of the period record the farming family, Tomkinson, as the occupiers from 1840 to the 1900s. The two cottages have now been combined to serve as Building Society offices. The original arrangement of assorted sash windows and the low doorway have been retained. The address for the combined cottages is No. 7 but presumably they were originally 7 & 9. The adjoining three-storey farmhouse had a frame-knitting workshop added at the rear at some time before 1840. This can be seen from the car park of the Chinese Restaurant. For most of the 1900s, the three-storey building was Cadge the chemist’s, latterly, Dixon’s Pharmacy. Signs for, ‘Pratt’s motor spirit’ (petrol) and ‘Vacuum motor car oils’, can be seen on the c.1910 picture with a gas lantern bracket over the fascia. The building is now used as an electrical white-goods showroom. The electrical shop is in the two-storey building next door, No. 5, formally the Netherfield Co-op Store. Beyond this, in 1910, can be seen a three-storey shop with accommodation above. On the original postcard it is possible to decipher a sign reading, ‘Motor car for private hire’. At the end of the block is another three-storey building that faces onto both Market Street and the Market Place’ the main entrance being at the corner of the building. In living memory, these premises have served as a hairdressers, a sweet shop and Gas Board showroom. 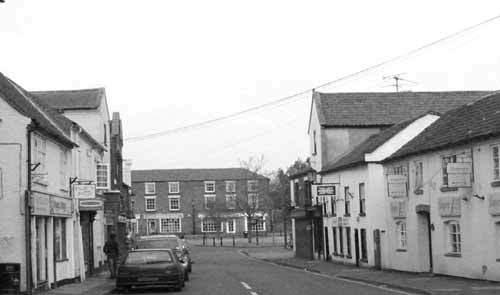 Between the two tall building, another photograph shows a small shop and three even smaller cottages with a total frontage of about 50ft. All were demolished about 1965 to make way for the Co-op car park. The viewpoint of the c1910 photograph, compared with that of the west-side of Market Street, means that the east end of the chequer-board brick building, Nos. 13,14,15 & 16 on the north side of Market Place is visible. In 2004 the building accommodates a dress shop and a video shop and a Chinese restaurant. Before WW2 No.15 and 16 served as the RDC office and during the war was an ARP post.